In C.N. 1636 Bob Meadley (Narromine, NSW, Australia) asked for further details about the ties between Bolton and Nelson. 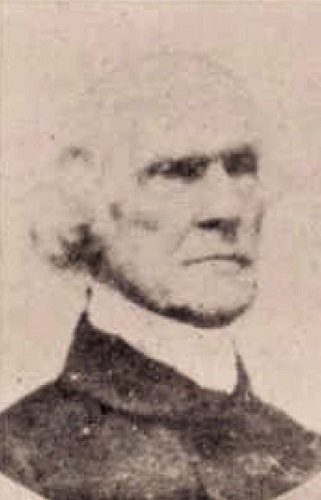 The answer can be found now on a detailed biographical page about Bolton by Stephen John Mann. The misattribution to Bone instead of Bolton is curious, and is perpetuated in one on-line problem database that we consulted. As regards the problem’s first appearance, Michael McDowell (Westcliff-on-sea, England) has informed us that the WinChloe database gives as the source ‘VII, New Court Gazette, 27 June 1840’ and lists over 30 reproductions. We have so far been unable to find that edition of the New Court Gazette. 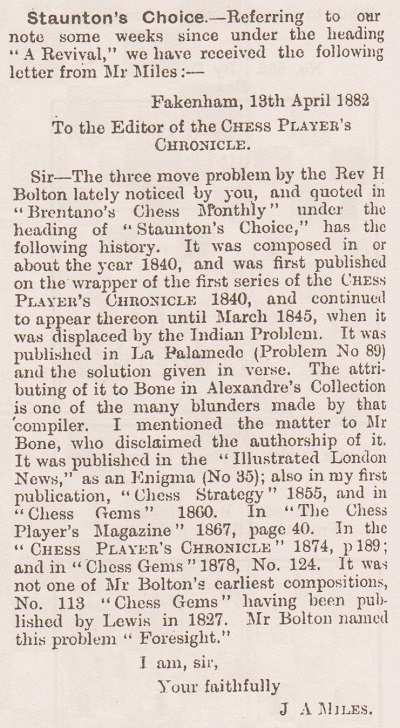 It is also difficult to show the problem’s first appearance in the Chess Player’s Chronicle, given the scarcity today of copies which include wrappers. 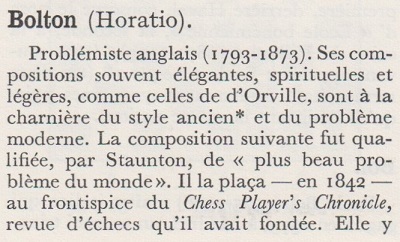 What precisely Staunton stated in print about the problem on one or more occasions remains unclear. The solution is given at the end of the present article. The photograph in Weenink’s book, the small portrait shown in C.N. 3467, is reproduced at the top of the present article courtesy of Mr McDowell. ‘A new specimen of odds which, so far as I know, originates with myself, has been lately patronized here, and I wish for your judgment as to the relative strength of the parties. The BCM page (June 1882 issue) listed by Gaige was the monthly ‘Almanac’ feature, mentioning only that Bolton was born on 2 June 1793. A discussion of Bolton’s status as a problemist, together with biographical information, was presented by H.J.C. Andrews in the Huddersfield College Magazine, February 1878, pages 191-194, June 1878, pages 241-244, and September 1878, pages 329-330. 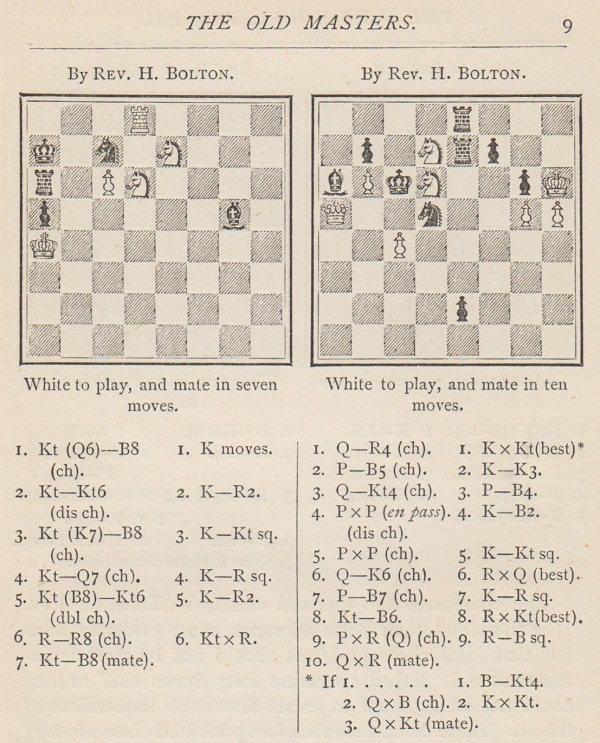 The final part noted that many specimens of Bolton’s work had just been published in the new edition (London, 1878) of Chess Gems by J.A. Miles. 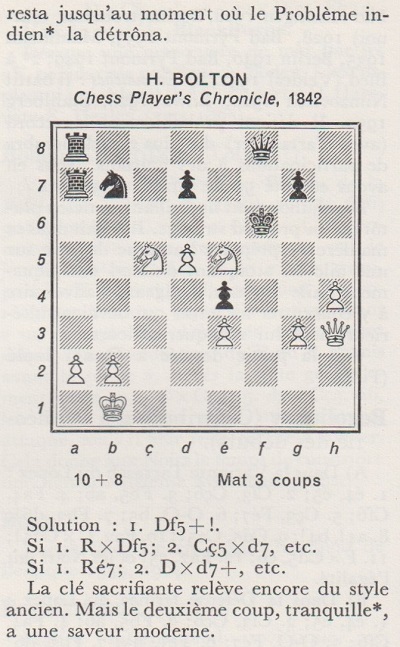 Solution to the seven-mover in C.N. 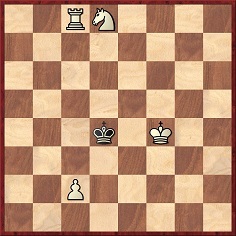 134: 1 Rc7 2 Rc6 3 Nf7 4 Ne5 5 Nd3 6 Nb4+ 7 c3 mate. Black’s moves are forced. 1 Nf7 also mates in seven. Latest update: 22 August 2018.